Can you believe that the 4th annual Murals in the Market is less than one week away? We at J’adore Detroit are SO excited. Murals in the Market is a collaborative festival that incorporates mural creation with fun activities such as dinners, block parties, meet and greets, panel discussions, and nighttime festivities. It’s based in Eastern Market and runs from September 13th to the 22nd. Murals in the Market will include 10 days of art creation, bringing both national and international artists to the city of Detroit for this event. Click here for the full 2018 artist roster! In an attempt to beautify Eastern Market, Murals in the Market has brought traffic to the lesser known parts of the city, including businesses and areas that have gone relatively unseen. The Smithsonian named Murals in the Market "one of the top mural festivals in the world". Join us at 1xRun’s new home, just east of Eastern Market, for a backyard barbecue! This event will serve as a warm welcome for this year’s participating artists, and it’s a great opportunity to chill, have a hot dog and a beer, and listen to music provided by 1xRun CEO, Jesse Cory. It’s a nice preparation for all of the exciting events to follow! For the exact address of the event and more information, check out the Welcome Back BBQ event page. Mingle with the 2018 Murals in the Market crew and artists with a patio cocktail reception at Bakersfield Detroit! This is your chance to interact with those that are making the magic happen for this year’s event, and it’s the perfect little kickoff for the next 9 days. The event is sponsored by Del Maguey, and it runs from 9:30 pm to midnight. More info is on the event’s Facebook page, which is linked here. 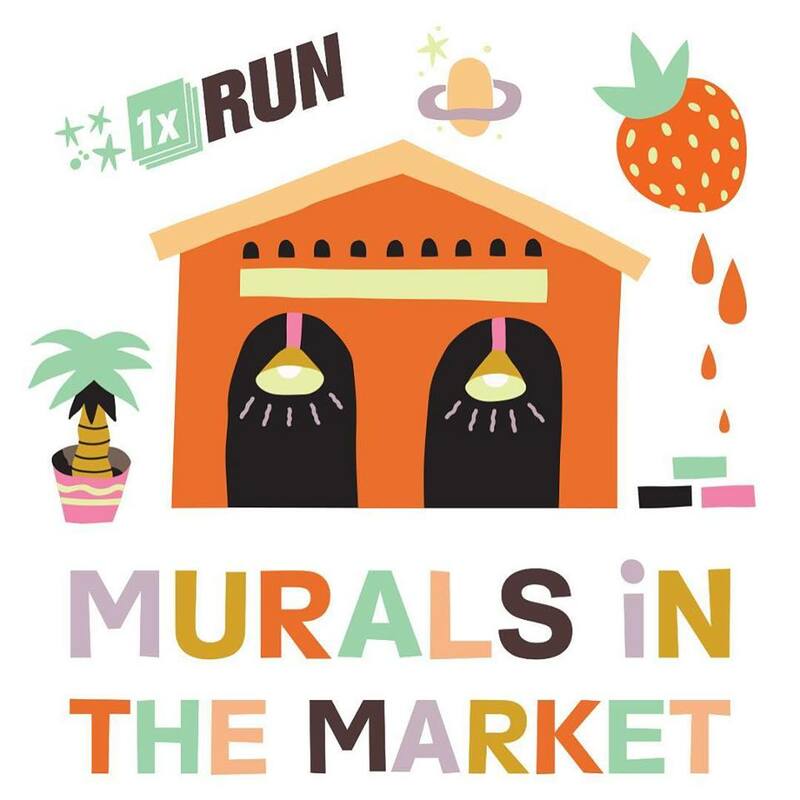 This event is your chance to take Murals in the Market home with you... well, sorta! From 7pm to 11 pm, 1xRun will be showcasing some of the participating muralist’s artwork, and there will be signed, limited edition art prints available for purchase. This event takes place at 1550 Winder, right in Eastern Market, it’s free, and all ages are welcome! There will also be music provided by Music provided by Chuck Flask (Paxahau) and photographer Ricky Powell. Green Living Science’s mission is to teach children about waste and recycling, and Murals in the Market is very excited to work with an organization with such important values. This is the event you DO NOT want to miss. 1xRun, Detroit Hustles Harder, The Crofoot, and Paxahau are presenting the Family Block Party, an all ages, family-friendly block party featuring artists such as DJ Jazzy Jeff, DJ Dez Andres, Midnight Magic, and more! The event will mix musical and visual art, with activations featuring Trae Isaac, Clifton Perry, Armageddon Beach Party, Detroit Electronic Quarterly, and more. There will also be plenty of food trucks, bars, and other vendors. The event takes place in the heart of the Market, at Division Street between Orleans and St. Aubin, and it runs as late as 2 am. The event takes place at 1550 Winder. More info is here. DJ Bleek will be providing the music for this event as you enjoy art, food, and drinks at the Detroit Shipyard. Murals in the Market crew members and artists will also be in attendance—it’s the perfect opportunity to have an interesting conversation. The Murals in the Market crew is back for more good times and good conversations for a bonfire at the Lincoln Street Art Park. This should be a chill event, accompanied by some great tunes. The event runs until midnight. The MITM crew and artists will be celebrating at Hamtramck’s coolest new bar, The High Dive! Fun fact, the bar is owned by MITM alum SharkToof. With music curated by Jefferson Davidson, it should be a good time. Click here for the address and other info. During the week of Murals in the Market, Community Push director Derrick Dykas and his team are building an entire skatepark in the alley behind the Red Bull House of Art, which will be open to the public during the week of the fest. It’ll truly be a sight to see. Come check it out and learn more. The closing party of this year’s Murals in the Market festival will coincide with the Detroit Design Festival's Eastern Market After Dark. Enjoy sounds by DJs Haylo and LadyMonix while you enjoy the works of this year’s artists. Also, cocktails by Southern Wine and Spirits are available for you to enjoy. Murals in the Market swag by Detroit Hustlers Harder and signed artists’ prints will be available to purchase as well! End Murals in the Market the right way. Murals in the Market will be collaborating with with InsideOut Literary Arts Project to present performances by award-winning young poet collective Citywide Poets. Six unique, young poets will read their poems in front of different murals throughout Eastern Market, combining visual art with the art of spoken word. There will also be a series of walking tours on September 22nd and 29th to showcase all of the Eastern Market murals. It’s a chance for the public to learn more about the murals, the artists, the festival, and the market. The tour takes place at the festival HQ at 1550 Winder. Comfortable walking shoes are recommended. Cameras are permitted, but crediting artists when posting pictures is strongly encouraged. Specific dates/times and tickets are available here. We know that MITM really amped up the events this year. If you can't make all of them, we really suggest you make it out to a few, especially the Family Reunion Block Party, which is all new this year. J'adore Detroit is proud to call Eastern Market home. Let's celebrate it together.